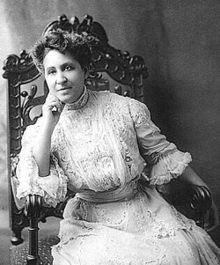 An influential educator and activist, Mary Church Terrell was born Mary Eliza Church on September 23, 1863, in Memphis, Tennessee. Her parents, Robert Reed Church and his wife, Louisa Ayers, were both former slaves who used their freedom to become small-business owners and make themselves vital members of Memphis' growing black population. From an early age Terrell and her brother were taught the value of a good education. Hardworking and ambitious, Terrell went on to attend Oberlin College in Ohio, where, in 1884, she became one of the first African-American women to earn a college degree. Four years later she earned her master's degree in education. Around this time she met Robert Heberton Terrell, a talented attorney who would eventually become Washington, D.C.'s first black municipal judge. In 1891 the couple married. Terrell was not someone who sat on the sidelines. In her new life in Washington, D.C., where she and Robert settled after they married, she became especially involved in the women's rights movement. In particular, she focused much of her attention on securing the right to vote. But within the movement she found reluctance to include African-American women, if not outright exclusion of them from the cause. Terrell worked to change that. She spoke out frequently about the issue and with some fellow activists founded the National Association of Colored Women in 1896. She was immediately named the organization's first president, a position she used to advance social and educational reforms. Other distinctions also came her way. Pushed by W.E.B. Du Bois, the National Association for the Advancement of Colored People made Terrell a charter member. Later, she became the first African-American woman ever appointed to a school board and then served on a committee that investigated alleged police mistreatment of African Americans. In her late years, Terrell's commitment to taking on Jim Crow laws and pioneering new ground didn't wane. In 1949 she became the first African American admitted to the Washington chapter of the American Association of University Women. And it was Terrell who helped bring down segregated restaurants in her adopted home of Washington, D.C. After being refused service by a whites-only restaurant in 1950, Terrell and several other activists sued the establishment, laying the groundwork for the eventual court order that ruled that all segregated restaurants in the city were unconstitutional. Toward the end of a life that witnessed fantastic civil-rights changes, Terrell saw the U.S. Supreme Court's historic Brown v. Board of Educationruling in 1954, which ended segregation in schools. Just two months later, Terrell died on July 24 in Annapolis, Maryland. Today, Mary Church Terrell's home in Washington, D.C., has been named a National Historic Landmark. I cannot help wondering sometimes what I might have become and might have done if I had lived in a country which had not circumscribed and handicapped me on account of my race, but had allowed me to reach any height I was able to attain.